America's air arms are increasingly under the threat of a wide array of surface-to-air missile systems, search radars and electro-optical tracking devices, yet it would take an air armada to move all these separate systems to training locations around the globe. The Joint Threat Emitter takes care of this problem. It is well known that America and NATO countries have enemy sensor and SAM systems to train against in real-world like exercises such as Red Flag. Mobile Roland SAM systems, SA-2 and even S300 surface-to-air missile systems can be spotted throughout the Nellis Range Complex. Yet these are rare, hard to maintain, and not necessarily mobile systems that also carry some political risk, as some were most likely acquired under less than legitimate circumstances. With this in mind, they are not exactly something you want seen being rolled off of a C-5 at an international airport in Europe before a big NATO air combat exercise. Aside from the more sensitive actual enemy radars and SAM systems in American hands, other threat simulators have existed for many years of various complexities and scales, but they often replicated one or just a couple of types of known enemy systems, which was far less than ideal. As a result of these limitations Northrop Grumman and the DoD came up with a novel idea, build one unit that could be easily transportable via a large cargo aircraft, that could replicate numerous types of threats that allied aircraft may face. Thus the Joint Threat Emitter (JTE) was born. The JTE concept is especially useful for America's fighter, bomber, and especially its "Wild Weasel" F-16CJ Block 50/52 squadrons that are based abroad, as in the past they only had a small selection of enemy radars to train against if any at all. The same can be said for America's electronic attack and jamming force of EA-18G Growlers, located at NAS Whidbey Island in upstate Washington. Now, with the JTE, these "customers" have a full menu of different simulated enemy radar systems to train against, not to the mention having to elude highly trained operators that run the JTEs who can throw different tricks at aircrews just as the enemy would in combat. What also makes the Joint Threat Emitter very cool is that it can be networked into a greater simulated integrated air defense system (IADS), and it can change the threat it simulates within that larger network based on what country or general capabilities American and allied crews are virtually fighting against. It can also be tied directly into the Air Combat Maneuvering Instrumentation (ACMI) system for cuing, so that long-range search radars can be virtually simulated along with the unit's shorter-ranged acquisition and engagement radars normally associated with SAM sites. The JTE also is built to add to a user's high-fidelity debriefing system so that aircrews can gauge with great accuracy how well their tactics worked in relation to the threat JTE was presenting. These tactics may include avoiding, engaging, jamming, suppressing (firing a simulated AGM-88 HARM) or destroying the simulated enemy radar and/or SAM site being replicated. JTE's data can be seamlessly integrated with a rangeless or range enabled ACMI system so that the effects of the simulated SAM site can be reviewed in relation to an overall "big picture" of the simulated air war. In the end, the Joint Threat Emitter, and similar systems such as the less complex Joint Deployable Electronic Warfare Range, allows for American and allied pilots to get much more training value out of each flying hour, which in the case of an F-16CJ is about $20,000. Additionally, if the JTE is forward-deployed it means that these aircraft don't have to spend millions of dollars flying to where the training asset is, as it can come to them much more cheaply, or be based locally in a permanent fashion. By leaving little to the aircrews' imagination while providing a clear evaluation of the effectiveness of their attacks and countermeasures, joint training between closely related aircraft, such as the F-16CJ and the EA-18G Growler, can be of much higher quality and of much greater value. It is hard to argue that these systems are not worth every penny they cost, plus they are a nice piece of kit to load onto a C-5 and take over multi-national training exercises to see how our friends, even questionable ones like Pakistan, do when faced with different surface-to-air missile threats. 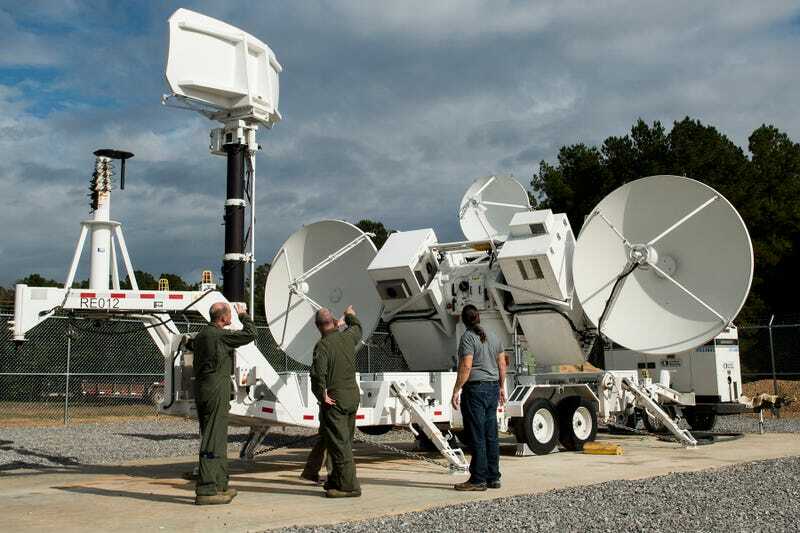 The Joint Threat Emitter is known to have been deployed or stationed at Alaska, Guam, Louisiana, Washington State, Nevada and the Middle East, and most likely dozens of other locations that remain undisclosed. The project has been so successful that a follow on contract has been awarded to Northrop Grumman worth hundreds of millions of dollars and includes the sale of the Joint Threat Emitter to some of America's allies. The next stage of the JTE will include modular upgrades including new plug-and-play threat emitters and software, which will allow for the JTE to be even more re-configurable and adaptable than it already is today. All this is a good thing, seeing as if you are going to spend tens, or even hundreds of billions of dollars on combat aircraft, then you might as well spend a few hundred million dollars on the best training tools available so that they have the best chance of coming back to be used again should they have to be employed in anger against a capable foe. For more info on the JTE click here and here.